Have a question on QX70? QX70 is available in 6 different colors - Black Obsidian, Graphite Shadow, Majestic White, Liquid Platinum, Malbec Black and Midnight Mocha. Watch latest video reviews of Infiniti QX70 to know about its interiors, exteriors, performance, mileage and more. The growing luxury vehicle division of Japanese automaker Nissan, Infiniti has entered the field of luxury cars and has been successful in finding a prominent platform for itself among the other renowned luxury car make0rs with its consistent victories. One of the assets of the company, which has played a recognizable role in the success of the company, is the Infinity QX70. The car is a mid-size luxury crossover SUV which is produced by the Japanese automaker since the 2003 model year. The car is expected to perform well against its competitors, the Porsche Cayenne and Volvo XC90. The fascinating features incorporated in the interiors of the car easily captivates your senses. The interior cabin has every possible technology and convenience to buy a pleasurable driving experience for you. Have a look at the driver's cockpit and you will see a leather-wrapped multifunction steering wheel with electrically tilt adjustable power steering, intuitive touch screen navigation system and a precisely-configured instrument cluster. The passengers will love to enjoy the comfort gifted to them by the large seats with front and rear seat armrests, dual-zone automatic air-conditioning system, 11-speaker Bose Premium Sound System and the moon roof. The spacious 702-litre cargo volume featured by the car is also desirable. 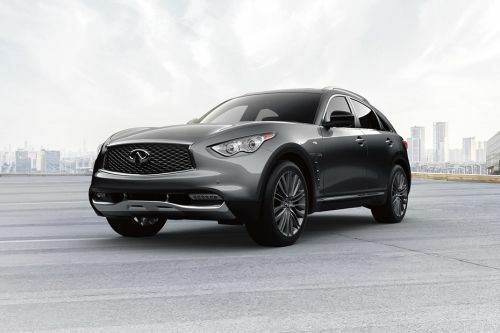 The grace was never so gracious until it was amalgamated with the curvaceous body of Infinity QX70. The car displays a confident elegance with its artistically crafted front design, which is a product of the stylish HID (High Intensity Discharge) bi-functional Xenon headlights, entirely chromed classy radiator grille with the company's logo shining at the centre, fluidic and curvaceous bonnet design and the well-tweaked front bumper design. The sporty trait injected in the car's DNA is evident with the integrated rear spoiler, trendy LED taillights, 21-inch Enkei alloy wheels, speed-sensing flat-blade variable wipers and the aluminium roof rails. The dimensions on which the exotic SUV is built are expressed as (L x W x H) 4865mm x 1925mm x 1680mm along with a wheelbase of 2885mm. The solemnly enchanting SUV comes with 3 equally desirable variants – the QX70 3.7 L variant, QX70 5.0 L variant and the new QX70S Elite Sport, which features a more sporty dynamics and is powered by a 3.7 litre V6 engine, same as the QX70 3.7-litre variant. The heart pumping under the hood of the most dynamic QX70 5.0-litre variant is a 5.0-litre V8 DOHC (Double Overhead Camshaft) engine with CVVTCS (Continuously Variable Valve Timing Control System), which lets you secrete some extra adrenaline with the ferocious maximum power and torque output of 390hp at 6500 rpm and 500Nm at 4400 rpm respectively. The 3.7-litre engine however churns out a good 329 hp at 7000 rpm and a max torque of 360 Nm at 5200 rpm. The electronically controlled 7-speed automatic transmission, connected to the engine fetches the car an acceleration value, for which the car attains a speed of 100kmph from naught in just 5.6 sec. The car manages to keep the fuel consumption within the boundaries with a mileage of 13.8 litre/100km. The dynamism displayed by the car is made safe by the large array of safety features including the handling assists like the Vehicle Dynamic Control (VDC) and Traction Control System (TCS), braking assists like the Brake Assist, Electronic Braking System and Anti-lock Braking System. The other safety features includes the Tire Pressure Monitoring System, Parking Sensors and Advanced Air Bag System (AABS). The car encloses an efficient braking system consisting of the front and rear wheels ventilated disc brakes. Call it luxurious or call it dynamic, this SUV will justify both the adjectives. The low fuel economy is the only major con of the Infiniti QX70. What are the colors options available in Infiniti QX70?